Não faz muito tempo, os cartazes nas fachadas de cinemas, teatros e salas de espetáculos,eram pintados à mão. Ao contrário da padronização dos cartazes executados com programas de design gráfico e photoshop, cada sala de cinema fazia a sua versão em pintura. Eram invenções genuínas e viajantes que hoje parecem se opor à mesmice da indústria cultural. Havia algo de primitivo e de pop nesses cartazes, frutos de pinturas sinceras e despretensiosas. Sem qualquer nostalgia, Vânia Mignone recorre à visualidade desses cartazes antigos.É como se a sua pintura composta por quatro placas de compensado avermelhado – com as palavras “o grito” e, grafado ao contrário e espelhado, “o eco” –ilustrasse um filme imaginário. Apesar do título estridente, a pintura é silenciosa e, de fato, reverbera na memória do espectador como se já fizesse parte de nosso repertório visual. O personagem de olhos fechados, refletindo num movimento introspectivo e os pássaros sobre sua cabeça acentuam o tom onírico de um fragmento de narrativa. Algo semelhante se passa na pintura espelhada que anuncia “sessão 19h, sábado, as gêmeas”. A presença de letreiros que marcam o dia e horário reforça a ligação com a tipografia limpa, sem serifa, e improvisada de alguns cartazes. Mas Vânia Mignone está longe de ser uma pintora ingênua. Formada em artes e publicidade, em sua trajetória travou diálogos com a poesia visual e a tradição concretista, o que a afasta do aspecto pueril de muitos cartazes tradicionais. Há alguma proximidade de Vânia Mignone com o repertório pop, tal como os letreiros comerciais, kitsch e irreais exaltados por Robert Venturi em Aprendendo com Las Vegas. A sua série de gravuras pintadas revela paisagens do interior paulista vistas do ponto de vista do carro. As placas das rodovias como “Desvio por Paulínia” ou letreiros tridimensionais que anunciam a chegada a alguma cidade, como “Lins”, evidenciam o percurso pelas estradas, e a visão através do para-brisa do automóvel.As pinturas em que o horizonte está sempre se deslocando, mesclam algo de uma espontaneidade popular com o planejamento cuidadoso. Os trabalhos de Vânia Mignone são permeados por recortes, colagens e dobraduras. A goiva é com frequência aplicada diretamente sobre o papel para buscar uma camada branca no fundo.Nas xilogravuras não há um desenho para cada madeira ou uma madeira para cada cor. Além disso, a artista contraria a cartilha tradicional ao imprimir com tinta acrílica em vez das tintas próprias para impressão.O suporte é de papel garimpado em livros de sebos, geralmente de impressões em couché da Taschen Books. Propositadamente as pinturas carregam ondulações, brilhos e as vezes resquícios das impressões originais.Seus trabalhos nunca partem de imagens fotográficas, nem as usam como referência e, apesar da crueza da técnica, não perdem a delicadeza. Na pequena série de pinturas e colagens vermelhas, os movimentos dos personagens são claramente encenados. Aquio parentesco com o universo das histórias em quadrinhos é evidente. Mesmo assim, a artista não caracteriza completamente seus personagens, tudo se passa com se eles não pertencessem a época alguma e vivessem num tempo suspenso. Há certo ar dissimulado neles. Mesmo quando não há personagens, como na série branca do “palco-quarto”, existe uma mise-en-scène, uma artificialidade e uma discussão da representação. Vânia Mignone possui um estilo identificável não porque ela tenha um vocabulário pré-definido, mas por possuir um modo de fazer que, mesmo mudando a cada nova mostra, guarda um jeito próprio. Se nas paisagens das estradas há elementos gravados que se repetem, aos poucos percebemos, a partir da inscrição em uma de suas pinturas, que não somos nós que passeamos pelo paisagem, mas é o “horizonte viajante”. Um horizonte em aberto, indefinido, que chegará a nós pelas imagens do cinema ou pelo movimento nas estradas. Not long ago, the signs on the façades of cinemas, theaters and showrooms were hand painted. Unlike the standardized signs made with graphic design software and Photoshop, a custom-painted billboard announced the newest feature film at each movie house. They were authentic, traveling inventions that today stand in contrast to the uniformity of the culture industry. There was something primitive and pop about those signs, the result of sincere and unpretentious painting. Without any nostalgia, Vânia Mignone recurs to the look of those old signs. It is as though her painting composed of five sheets of reddish fiberboard - with the words “o grito” [the scream] and, written backwards and mirrored, “o eco” [the echo] - illustrates an imaginary film. Despite the strident title, the painting is silent and reverberates in the viewer's memory as though it were already part of our visual repertoire. His eyes closed, the character seems to be reflecting in an introspective moment, while the birds above his head accentuate the dreamlike tone of a fragment of narrative. Something similar takes place in the mirrored painting that reads: “sessão 19h, sábados, as gêmeas” [7 p.m. session, Saturdays, the twins]. The presence of signs that announce the day and time reinforces the link with the clean sans-serif and improvised typography used on some signs. 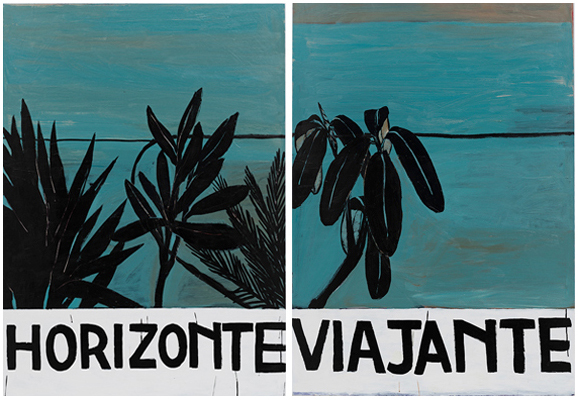 But Vânia Mignone is far from being a naïve painter. With a degree in arts and advertising, in her career she has engaged in dialogues with visual poetry and the concretist tradition, which separate her from the ingenuous aspect of many traditional signs. Vânia Mignone's work bears some proximity to the pop repertoire, as well as to the commercial, kitsch and unreal signs praised by Robert Venturi in Learning from Las Vegas. Her series of painted prints feature landscapes of the interior of the state of São Paulo seen from inside a car. Road signs such as “Desvio por Paulínia” [Detour to Paulínia] or three-dimensional signs that announce the arrival at some city, such as “Lins,” evoke the route along the highways and the view from behind the automobile windshield. The paintings in which the horizon is always shifting evince a blend of popular spontaneity with careful planning. Vânia Mignone's works are pervaded by cutouts, collages and foldings. The gouge is often applied directly on the paper to seek a white layer in the background. In the woodcuts there is no drawing for each wood nor a wood for each color. Moreover, the artist flouts the traditional rules by printing with acrylic paint instead of printmaking inks. As a support she uses paper she finds in used bookstores, generally pages printed on glossy paper by Taschen Books. Areas of the paintings are purposefully rippled, or bear traces of the original printing. Her works are never based on photographic images, nor do they use them as a reference - and, despite the crude technique, they are delicate. In the small series of red collages and paintings, the movements of the characters are clearly staged. Here the relationship with the world of comic books is clear. Even so, the artist does not completely characterize her figures; everything takes place as though they did not belong to any era and were living in a suspended time. There is a certain dissimulated air about them. Even when there are no characters, as in the white palco-quarto series, there is a mise-en-scène, an artificiality and a discussion about representation. Vânia Mignone possesses an identifiable style not because she uses a predefined vocabulary, but because she has a method of production that keeps its essential character even though it changes at every show. If in the highway landscapes there are engraved elements that repeat, we gradually perceive, based on the inscription in one of her paintings, that we are not passing through the landscape; rather, it is “traveling horizon.” An open, undefined horizon that will arrive to us either through cinema images or through movement on the highways.